Bizantine Cross, crosses, cristian crosses. On Good Friday, Christ died to redeem the sins of mankind on the Cross at Golgotha outside Jerusalem (Matt.27,33-56; Mark 15, 22-41; Luke 23, 33-49; John 19, 17-30). This composition shows Christ on the cross on top of a hill. Christ is shown dressed in a loin cloth, with head sunk down, body bowed and blood flowing from his wounds. The skull isdide the hill is that of Adam. The towers of Jerusalem rise in the background. 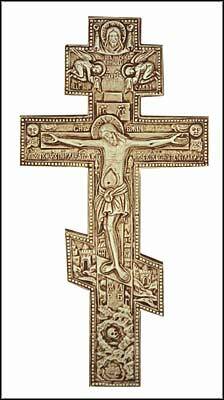 At the top of the cross we see the Sudarion Cloth of Vernicle, also known as �The Holy Napkin�. The Sudarion refers to the miraculous transference of Christ�s image onto a piece of cloth which he used to wipe his face. Below the Sudarion we see the kneeling images of two weeping angels: Archangels Michael and Gabriel.